Empress wuthe largest hosta of the world!!!! ‘Hostas are one of the most popular perennials sold all over the globe. These shade tolerant plants, with a wide variety of sizes, leaf shapes, colours and patterns are the passion of countless hobbyist, collectors. breeders, clubs and societies’. It is not fully clear of which Hosta Empress Wu has its origin. It even is said to be quite complicated. It is a self pollinating crossing of Hosta Big John x Hosta Big John. 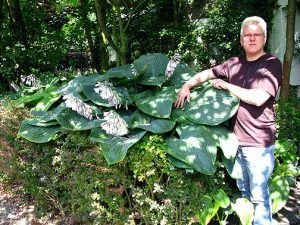 The ‘walking Hosta encyclopaedia’, Mr. Danny van Eechaute(see November issue) says to believe, that Hosta Empress Wu has the intricate background of the Hosta sieboldiana Elegans hybrids. Elegans is derived of the Latin word eligêre which means: elegant; graceful; tastful. Sieboldiana refers to the German Mr. Franz von Siebold, born in 1796 in the German city Würzburg and who died in 1866 inthe German city Munich(München)In 1822 he took office as an Officer of Health Service in the Dutch-Indian Army. He left for Japan in 1823 where he stayed till 1830 as a medical practitioner, where he got together ethnological and botanical collections. These collections are nowadays deposited in the DutchCity of Leiden. Franz von Siebold again stayed in Japan from 1859 – 1862. He became a specialists of the Japanese nature and was the Author of many and important books about botanical; zoological; ethnological; linguistics and biographical publications, under which his main and never completed book, ‘Flora Japonica’ (1834-1844). Hosta Empress Wu is an unique plant and the largest Hosta, ever developed. Unlike its parent, Hosta Big John, it bloomsearlier and longer. It makes a focal point in the garden. The huge; dark green, deeply veined leaves form a massive clump. The flowers are pale reddish violet. The first plant from seed of Hosta Empress Wu is 6 years old now. The clump of this mature plant has a width of 250 cm and a height of 150 cm!!! and the individual leave has a length of over 60cm, which makes this Hosta exceptional suitable for the production of decorative leaves for the benefit of flower bouquets. The size of 2.5 metre width and 1.5 metre high was reached in the dry and hot climate of the great plane area of the central United States. Brian Skaggs says: ‘Hostas are better acclimated to the maritime climates of places like Japan. We are very anxious to know how big Hosta Empress Wu can grow in other climates, more suitable to grow Hosta’. Hosta Empress Wu is a so-called seasonal variety, which means that the colour of the leaves changes during the season. Empress Wu has a slightly glaucous coat on top in Spring which causes the blue-like colour of the leaves. The layer of wax disappears largely during the season so that the blue- like colour changes to greenish grey. Hosta Empress Wu was registered in 2008 in Lowell, Indiana(USA) by Brian and Virginia Skaggs, being the originators; introducers; registrants(AHS registration) and the namers of Hosta Empress Wu and having the following notable characteristics mentioned: Huge size; less mature plants quite upright, upon maturity, center leaves push outer leaves to sweep the ground!!! The name of Hosta Empress Wuis well chosen. During the most glorious years of the Tang dynasty (618-705 AD) a woman ruled China successfully. It was the Female Heroe, Empress Wu Zetian, the only female in Chinese history who ruled China as emperor. Some say:she was ruthless in her desire to gain and to keep power; others say: she was a woman doing a ‘man’s job’ what she had to do, acting no differently than most male emperors of her days. The Tang dynasty was a time of relative freedom for woman. A number of exceptional woman contributed in the areas ofculture and politics. Wu was born in a noble family and was taught to play music, write, and read the Chinese classics. At the age of thirteen, she was known for her acuteness; intelligence and beauty, and was recruited to the court of Emperor Tai Tsung, and became his favourite concubine. When Tai Tsung died, his son Kao Tsung took over the reign. Wu was 27 years old at that time and she became the main concubine of Kao Tsung and gave birth to the sons he so wanted to have. She managed to eliminate Kao’s Tsung’s wife, Empress Wang, by accusing her of killing Wu’s newborn daughter(actually Wu killed her daughter herself). Kao Tsung believed her, and replaced Empress Wang for Wu Zetian. After Kao Tsung, having had a stroke, Empress Wu took over the administrative duties of the court, which was a position equal to the emperor. She created a secret police force to spy on, her opposition, and cruelly jailed or killed anyone who stood in her way, including the unfortunate Empress Wang. With the death of Emperor Kao Tsung, Wu managed to outflank her eldest sons and moved her youngest and much weaker son, into power. She in effect ruled, telling him what do do. In 690, Wu’s youngest son removed himself from office and Wu Zetian was declared emperor of China. She reduced the army’s size and stopped the influence of aristocratic military men on government by replacing them with scholars. Wu was fair to peasants as well, lowering oppressive taxes, raising agricultural production, and strengthening public works. During her reign, Empress Wu placed Buddhism over Daoism as the favoured state religion. As she grew older, Empress Wu lessened the power of her secret police, but she became increasingly superstitious and fearful. Sorcerers and corrupt court favourites flattered her. In 705 she was pressured to give up her throne in favour of herthird son. Wu Zetian died at the age of eighty in the same year. Brian was born in the southern region of California and got ‘a love for nature’ from his mother. He studied at PardueUniversity in Indiana. He got a job as a ranger/naturalist in a national park in California. Eventually Brian moved to Indiana and settled for the last time on land that once was the homeland of the indigenous Pottawattamie Indians, which was also the homeland of his maternal grandmother in 1976.Brian went on to a career as a horticulturist, working with the public and moved to the State Parks of Michigan where he met his wife to be: Virginia!! Virginia was born and grew up near Lake Michigan. She learned gardening from her father, an avid gardener who grew vegetables to supplement the store bought groceries. She went on to study horticulture as a young adult at MichiganStateUniversity. She went on to a career as a horticulturist, working with the general gardening public. 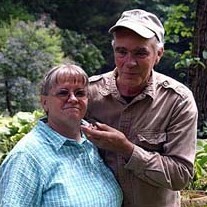 In 1992, Brian and Virginia met each other, while working at the international exposition ‘Ameriaflora’, in an horticultural interpretation centre named: ‘America’s Back Yard’. This interpretation centre was located next to a Hosta display garden, sponsored by the American Hosta Society. Brian says: ‘shall we say the seeds of things to come were planted at this time?’. By the mid 1990’s, their Hosta hobby had evolved into a passion which in time grew to be a near obsession. They formed an informal group of Hosta hybridizers which they called the ‘Fraternal Order of Seedy Fellows’ that spans half the continent. 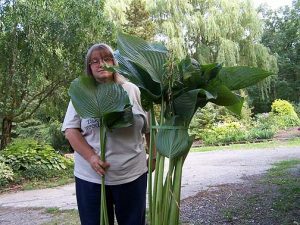 Brian and Virginia, still are hobbyists, however, Hosta Empress Wu iis their first attempt to introduce a new Hosta to the gardening public, commercially. Brian says: Hosta Empress Wu is a unique plants in his experience. Sometimes he jokes with friends, saying: ‘Tie a bunch of Bananas to Hosta Empress Wu to tantalize the neighbours into thinking that you are growing Bananas in your garden. Hosta Empress Wu is “a must have” for every lover of large leave Hostas. Hosta Empress Wu is a ‘Giant Hosta Monster and that’s why the chosen name is perfect.